For the second time in three seasons, the Golden State Warriors can lay claim to being NBA Champions after they defeated the Cleveland Cavaliers, 4-1, in the 2017 NBA Finals. Kevin Durant played a pivotal role for the Warriors’ championship run, averaging 35.2 points, 8.4 rebounds, and 5.4 assists per game on his way to being named NBA Finals MVP. But there’s more to the story than the opening paragraph of this piece. There were viral moments, career-defining performances, amazing stories, and of course, controversy and drama. A great narrative unfolded over the past two weeks in Oakland, Calif., and Cleveland, Ohio. For those who enjoy watching the best athletes in sport, the Finals provided fascinating entertainment. But for those who love the art of writing in any and all forms, the NBA’s global appeal was on full display as scribes produced compelling content on a daily basis. Other sites will break down the nuances of the games in greater detail. For Bloggr, we’re taking a close look at the crafting of stories. So after looking through the stellar coverage of the Finals, we’ve examined the top moments in writing and how you can be inspired when it’s your turn to write. Let’s see who shined under the spotlight and had a Durant-like performance on their keyboard. Behind-the-scenes at Game 1 of the as the go up 1-0 with big home W! In a postseason in which they have seen little to no competition, the Golden State Warriors kept right on rolling and tied the N.B.A. record for consecutive postseason wins at 13 with a 113-91 drubbing of the in Game 1 of the . Why We Liked It: Hoffman captured the essence of the story in just 50 words. Anecdotal ledes are great, too, but sometimes it’s critical to offer the best snapshot of the story topic early to honestly explain it to the reader. Get. To. The. Point. What we could not have expected, though, would be (Rihanna’s) wide-felt impact Thursday. After her entrance was announced emphatically by (announcer) JVG (Jeff Van Gundy), she went on to support her favorite player (LeBron James) as only she can. Early in the fourth quarter, as the Cavs trailed by 22, Rihanna rose to pay her respects to the King. She bowed, and then let the presumably annoying fans around her know that a 22-point deficit means nothing to her. She indicated this with the dab. 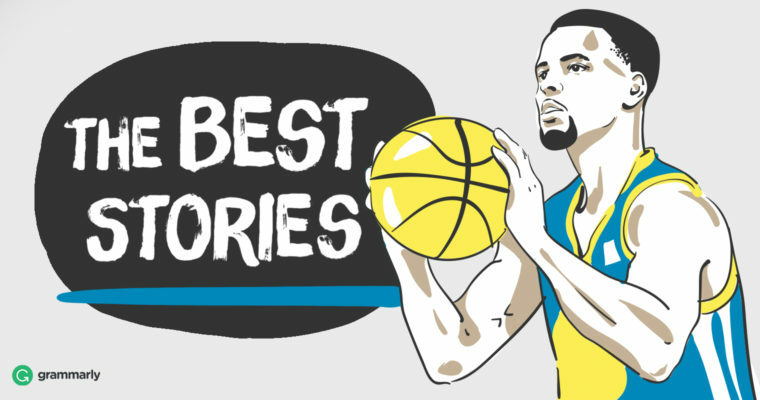 Why We Liked It: When the subject of your story is dull—like the uninspired on-court product in Game 1—it’s always a good idea to take the story angle elsewhere. In this case, Litman’s decision to write about a human-interest topic on one of the most famous people on the planet was a wise one. Litman had some fun with the music superstar’s courtside presence and friendly in-game banter with Durant. By examining a social media trending topic in a not-so-exciting game, Litman showcased an admirable way to cover a secondary (maybe even tertiary) angle to a major event. Creativity should always be a main principle anytime you write. Behind-the-scenes at Game 2 of the …won by the 132-113! Story Headline: Are the Warriors’ brogrammer army the most hated fans in sports? Part of the problem is simple demographics. Bandwagon jumpers are considered to be the lowest form of fan – even below drunk, belligerent and face-painted – whereas the diehard, thick and thin, fan-since-birth group is the most respected. Because of the massive influx of people into northern California with the tech boom, many of those filling the choice seats at Oracle Arena have ties to the region that are tenuous even compared to those of Kevin Durant. Yet they’re cheering their hearts out for their beloved Warriors every night, while across the street the last place A’s – with the second-worst attendance in all of baseball and portions of the upper deck covered in tarp – don’t seem to have captured the imagination of Silicon Valley big wigs. The new Warriors fan has not suffered anything near the sports heartache of a Cleveland lifer. Their toughest season to endure was one in which the Warriors won an NBA-record 73 games. Sad! Why We Liked It: There’s a lot to unpack from those two graphs. You can’t entirely discredit Gallo’s opinions on how he views Golden State’s fan base. What you can appreciate, however, is the writer’s ability to offer sound reasoning for his views along with a dash of comedic wit. Further, the headline of the piece introduced the comedic tone that carried on throughout the story. It’s also refreshing to read this angle from an international outlet like The Guardian. It speaks to the NBA’s global appeal and why the Finals were the most-viewed in nearly twenty years. Story Headline: The Warriors are making the NBA Finals noncompetitive. That’s scary for the league. These Finals must be making the league nervous. The team with the best player can never be counted out, and LeBron James remains the best player in the world, despite the argument Durant is currently submitting. It would be a mistake to dismiss Cleveland. It would be equally foolish not to recognize the strong chance that for the remainder of the Finals, and perhaps beyond, the Warriors’ only competition will be history. Why We Liked It: Kilgore explored the significance of another lopsided Warriors win early in the series. In doing so, the writer wondered about the ramifications of the decisive victories for the league. He also tracked down the NBA’s commissioner, or pseudo-CEO, to get his view on how a non-competitive series could impact the league’s bottom dollar. Having the gusto to discuss a deeper viewpoint on a topic is one thing, but gathering supporting quotes, research, or commentary to further develop your point is the stuff of writing mastery. The biggest takeaway here is don’t be shy about getting the supporting information you need for your claims. Kevin Durant's BIG trey headlines the top clutch moments in Game 3 victory! Test the Warriors at your own peril. So many of the teams to stand in Golden State’s way this postseason have been subject to cold obliteration—the sort of blowout that leaves those involved shell-shocked and numb. Why We Liked It: The Warriors came from behind to beat the Cavs in gut-wrenching fashion. This headline summed up the feeling perfectly. It was just the best. But to add significant context to a mic-drop headline is just as critical for a writer. Just because you’ve come up with something clever and click-bait worthy doesn’t mean your job is done. Unlike the Cavs in Game 3, you have to finish what you started. Mahoney achieves this with excellent descriptive writing in his piece. He also explains why the Warriors have been able to demoralize their opponents. Sharp language, excellent descriptions, and well-researched presentation are achieved in this post. Why We Liked It: Writing to make your point with data is something that truly enhances the reader’s experience. Herring achieved this as a writer and visually by introducing the thought of Durant having more production at the end of games than James. Herring backed up his claim by breaking down his findings in a myriad of ways with visual representations. If you’re looking for a free way to boost your data claims, Google’s new is a superior way to boost your visual presentation. LeBron's off-the-glass SLAM in Game 4 of the … as heard around the world! That’s how incredible LeBron’s dunk was. Even Smith, a guy who once said he prefers to shoot contested shots because open ones are boring, was shocked at what James did. Maybe he’s on to something with James being a “Gatorade baby” made in a lab somewhere. If he’s still stunning his teammates at this point of his career, then what more is there for him to do? Why We Liked It: When you have a must-read quote to use in your piece, there’s sometimes heavy-handedness in how a writer reacts to it. In this instance, Barnwell explored the clever, “Gatorade baby” quip but doesn’t step on the beauty of the comment. Instead, Barnwell featured the quote as the subject of his post. James’ highlight-worthy dunk was one of the most memorable plays of the game. Barnwell seized the opportunity by showcasing the best soundbite on the play and wrote his story accordingly. Writers should try to include credible speakers to add authority to a story when it makes sense. They should also figure out the best ways to not overcomplicate the message of the quoted speaker with unnecessary commentary. Knowing how to handle great quotes is something all writers should take into account. Referees said a miscommunication with the scorer’s table led to confusion following a Draymond Green technical foul in the third quarter of Game 4 of the NBA Finals, leading to Green initially being announced as ejected before that call was overturned. A technical foul in the first quarter that official John Goble called on Golden State Warriors coach Steve Kerr was incorrectly recorded by the official scorer as being on Green. It was announced as being on Green, and it remained in the official box score that way. The mistake was not corrected. So when Green was called for a technical foul by official Marc Davis in the second half, it seemed as if Green should’ve been ejected. Only then was the mistake fixed, and Green was allowed to stay in the game. It was confusing for both teams and the crowd, who believed Green should’ve been ejected for having two technicals. Why We Liked It: There was a lot of confusion about officiating in Game 4. Many in the media complained about it. Knowing that this was a storyline with how Cleveland won its first game of the series, two ESPN scribes joined forces to state the facts on what led to some head-scratching decisions by the refs. Knowing the objective of your story is crucial. Windhorst and Holmes were aware that their readership wanted to understand what happened in the game and why it created so much confusion. Instead of being humorous or introducing quotes, the writers explained what happened in an educational tone. Knowing what your audience is expecting based on your subject or title is critical. Kevin Durant & Stephen Curry lead to Game 5 victory to secure 2017 title! On the biggest stage, and healthy, Curry proved he wasn’t a flash in the pan. That his two MVPs and 2015 championship wasn’t a fluke. Despite not having the freakish size of the likes of LeBron James and Kevin Durant, he proved he belongs. LeBron made it clear there is nobody in the NBA better than he. But there should be no more doubt Curry is in the mix with the game’s elite. Perhaps it was just a matter of time before he got here. Or maybe he needed to go through that collapse, feel the sting of not showing up, hear the jabs at his worth from across the nation, to become even better. Either way, the end result from this three-year run — two MVPs, 207 regular season wins, and two championships — is that he’s here now. This is what validation looks like. Why We Liked It: Most of our examples have touched on story angles, introductions, voice, quote usage, and even headlines, but once you’ve fully grabbed your readers and given them multiple reasons to read your writing and stick with it, you’ll want to make the full experience worthwhile. Thompson accomplished that in his coverage of Curry’s Finals redemption. Sure, most of the attention this series went to Durant and James, but Curry’s selflessness was a big reason the Warriors were able to win it all once more. Thompson nails that sentiment perfectly and sent the reader off with a perfectly crafted final line to his story. It was short and sweet, just like Curry the ballplayer. Now past 9 p.m., the Warriors finally rampaged back to the locker room for the champagne celebration, all the players handed a Moet & Chandon bottle on their way through the door. Durant was met by a dancing Draymond Green and Klay Thompson, already geared up in ski goggles, bottles popped, spraying the room. But Durant had some trouble. He struggled to get the bottle open initially. Then he failed in his attempt to bash a couple beer cans together for a booze shower, Stone Cold Steve Austin style. It’d been awhile since he’d had a drink. Nearly four months, actually. Throughout most of the season, Durant regularly went out after games, often drinking with dinner. But when he sprained his MCL back in late February, he decided to give up alcohol during the extended rehab process. So by the time Monday night’s celebration rolled around, his tolerance was lower and the booze hit quicker. The PR staff whisked him away from the locker room celebration around 9:25, first to do an interview with Scott Van Pelt on SportsCenter and then to his press conference on the other side of the arena. Why We Liked It: Slater puts readers in a place they desperately want to be—backstage with Durant after the biggest triumph of his basketball career. Access can make or break a written piece. If you’re experiencing something that nobody else is seeing, don’t internalize—publish it. Find the appropriate way to express your point of view of the event that you’re witnessing. Slater might not have written about everything he heard and observed after the game, but there’s enough detail in here to give the reader proper context as to what the whirlwind moment was like for a basketball hero. Once you’ve gained a unique vantage point to your topic, don’t waste your opportunity to describe it in detail. Slater’s words about Durant’s trouble with consuming alcohol wouldn’t be the same without the writer correctly setting the scene with the cause and effect. All of these stories were written to inform, entertain and document an important period in sports history. They were also produced under tight deadlines by professionals who love their craft. Aspiring writers at all levels can learn from reading expert coverage on topics they enjoy or ones they don’t fully understand. Good writing is good writing, as they say. It comes in all forms. Now it’s your turn to write with creativity, detail, and authority. You can do it. We know you can.